Bond solid rubber wheels are precision molded into a single unit of high grade rubber compound and are furnished with a soft or hard tread. They are available with self-lubricating bushings or straight roller bearings. Roller bearing wheels include end washers pressed into the hub ends to hold the bearing in place. Lubrication is through a pressure fitting in the hollow axle. Soft-tread, Durometer in 75 Shore A: A soft cushion tread is permanently molded to a hard rubber core forming a single unit providing maximum floor protection and quiet operation. The uniform thick cushion tread offers excellent mobility for manually moved loads on hard surfaced floors. The tread is resilient and abrasion resistant, and non-sparking. Hard-tread, Durometer in 60-80 Shore D: Composed entirely of hard rubber, these wheels provide higher capacities, easier rolling, quiet operation and excellent floor protection. Hard tread wheels are non-sparking and perform well on most firm floor surfaces. Bond all rubber wheels are non-marking, non-sparking, resistant to water, oil and most acids and provide good floor protection. Recommended operating range is -20 degree to 160 degree fahrenheit. Note: To order hard tread wheels replace last "S" with an "H". Example - 3-SRWS-1-6 for soft tread and 3-SRWH-1-6 for hard tread. A thick cushion tread of natural rubber or neoprene rubber is molded to a cast semi-steel or aluminum wheel center to provide a quiet running wheel offering maximum floor protection along with a cushioning effect on the load. This is a rugged, long wearing wheel widely used in floor and power truck applications and on many pieces of industrial equipment. The Vulc-on wheel is available with straight roller bearings or tapered roller bearings, making it an easy rolling wheel on almost any floor surface. This wheel is also available with a plain hub, keyway and or set screws to lock wheel to axle, special hub lengths or other wheel bearing types. Consult factory with the application needs. Operating temperatures are -40 to 160 degree Fahrenheit. 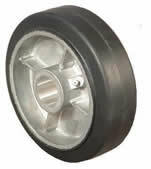 All Vulc-on wheels are lubricated through a pressure fitting located in the wheel hub. These wheels are available in three tread compounds to meet an almost infinite variety of industrial needs. This tread provides a maximum floor and load protection in combination with good wear and low noise levels during operation. Since the tread is soft, loads left standing for long periods of time may develop flat spots in the tread. 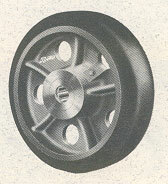 This wheel offers twice the capacity of the G1 compound. It is recommended for operating over comparatively smooth floors having no sharp obstructions. While the G2 compound does not have the flexing qualities of the G1, it still provides the resilience to protect floors and provides long service life. Very similar to the soft rubber (G1) in physical qualities and capacity, it is superior to rubber when in contact with oils, acids, animal fats, and other animal by-products, solvents of all kinds, and water exposure. Please specify G1, G2 or G3 in the part numbers below. These wheels should be used where a light aluminum wheel coupled with the performance advantage of the Vulc-on tread best serve your needs. In all respects the aluminum center wheel matches the performance characteristics of the semi-steel wheel center. 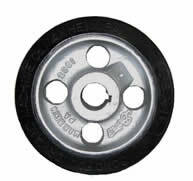 Aluminum center wheels should not be used around animal fats, blood, grease, oil or salt.